Ruben Navarrette: I'm frequently asked, "What kind of American are you?" 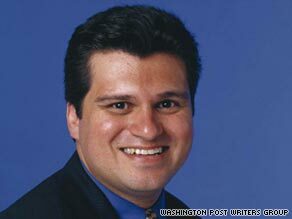 Editor's note: Ruben Navarrette Jr. is a member of the San Diego Union-Tribune editorial board and is a nationally syndicated columnist. Read his column here. Ruben Navarrette believes that legal immigrants are America's most valuable import. SAN DIEGO, California (CNN) -- Fourth of July weekend is as good a time as any to think about what it means to be an American -- even if there are those who insist you're not qualified for the job. Long before Barack Obama arrived on the national scene and was hit with unfair and often offensive questions about his allegiance, his patriotism and even his birthplace and nationality, I had already grown accustomed to having my own loyalties questioned. As a Mexican-American, I get it all the time. Whenever I poke holes in some dimwitted idea to curb illegal immigration or condemn a hate crime against an immigrant, I can expect letters with queries like: "Are you an American?" or "What kind of American are you?" I know what you're thinking -- that it's my fault for referring to myself with a hyphen: "A Mexican-American" as opposed to a plain ol' run-of-the-mill American. I don't buy it. I have friends who -- while they don't use hyphens -- call themselves "Irish" or "Jewish" or "Italian" or "German." Yet they're still Americans. They don't have to choose. Why should I -- just because some people are nervous about the Latinization of the country? Most of the missives come from anti-immigrant nativists scared silly by what they think will be their waning relevance given the changes that immigration brings to culture, language and country. Those at the other limits seem convinced that I'm a double agent funneling state secrets to my amigos south of the border to help reconquer the American Southwest. As I've told them, it'd be hard for me to orchestrate a conspiracy with folks in Mexico when -- thanks to the assimilation process -- we don't speak the same language. Not long ago, one reader issued a challenge: "Why don't you try being a real American?" The truth is, I don't have to try that hard. For one thing, I have the documents. I was born in the United States, as were my parents and -- in something that, I imagine, fewer and fewer Americans can claim these days -- so were three grandparents and a handful of great-grandparents. The fourth grandparent, my father's father, came to the United States legally as a boy during the Mexican Revolution, which lasted from 1910 to 1920. Of course, my grandpa gets no gold star for that, since -- in a fact lost on readers who boast that their ancestors came "legally" in the 19th century -- immigration wasn't widely restricted until 1924. Before then, almost all immigrants came legally. But more importantly, I'm an American -- a brown-skinned, Spanish-surnamed Yankee Doodle Dandy -- because I "get" what it means to lay claim to the title. I'm an American because I love and cherish freedom and democracy, and I want people around the world to have a shot at experiencing those things firsthand. I'm an American because I don't believe in isolationism or disengaging from the world. Rather, I agree with those who say the United States is the world's one indispensable nation. I'm an American because my sympathies always lie with the little guy (especially when he is being tormented by the big guy) and because I don't tolerate bullies, foreign or domestic. I'm an American because I reject protectionism. Why run and hide from foreign trade? If we produce unique and quality merchandise, we'll outsell anyone at any price. I'm an American because I believe that immigrants are our most valuable import and that we should welcome as many as possible -- as long as they come legally. And, last but not least, I'm an American because I believe that with sacred rights come equally sacred responsibilities -- to yourself, your family, your community and your country. When I say the Pledge of Allegiance ("... with liberty and justice for all"), I'm reminded that amid the discrimination, disregard and disenfranchisement endured by Mexican-Americans in the 1950s and 1960s, all my parents wanted was a seat at the table. By contrast, one day, my kids are going to want to run the table. They'll see that as their birthright as Americans.